It’s well past time for an update on the Russian Market. Last year proved to be a lot of fun as we watched Phyllis and Annie open a new gallery in O’Bryonville. Their two Russian shows have been attended by area collectors and curators, and many great works have found homes. We continue to get new works two to three times a year as Bob travels to St. Petersburg, Moscow and Voronezh. The Russian economy gains strength every year, which drives more study of the artwork and continues to keep prices for key artists climbing. The international nature of the market parallels activity in China and India as their markets open up and collectors and curators move in. It’s nice to know that the Russian cultural DNA is still intact. During the cold war, Russian families filled gallery openings and nothing sold, because there was no money. When Bob traveled to Russia recently, he attended an opening for Nikita Fomin. There were over 1,000 attendees and over half the 135 works sold (Now it’s DNA with money). Nikita had mixed emotions so many sold; he has only a few months to prepare for his next big show in China. We have the new book available on Alexsei Sokolov, as well as a few copies of Bown’s Dictionary of Soviet and Russian Painting. Bob continues to do more research for the book on Yuri Dyakov. We’ve discussed doing other books and shows of works we’ve sold over the past twelve years. I’m sure we’ll get them done someday. We’re always open for help and suggestions. The market continues to expand with regular auctions in New York, London and other major art centers. The good nineteenth century works have increased tremendously. Many of those works relate closely to the European and American works of the same period, because a number of the Repin’s instructors were European. With more research and books, the market is seeking the works by the top artists of the last half of the twentieth century. The Chinese are heavily collecting and showing artists like Fomin that their curators met while studying at the Repin during the Cold War. There are so many factors that determine art’s value, but many collectors today realize they can spend $30-40,000 for a good third tier American smallish work. 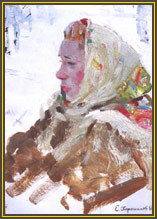 It’s still possible to purchase a large top tier Russian work from the 50’s to 90’s for similar money or less. Of course, there are a lot of excellent works for much less. Some of the artists to watch include Peter and Nikita Fomin, Vasily and Alexei Sokolov, the Tkachev brothers, Efrem Zverkov, Anatoli Levitan, Andrei Mylinikov, Vyacheslav Zagonek, Elena Tabakova, Vera Mylnikova and Sergei Repin. If you get a chance, stop into the Weston-Bolling Gallery to see the “Bread Lady.” You’ll know she will eventually be in a museum.